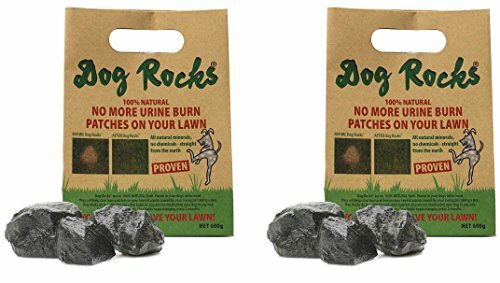 Dog Rocks are a 100% natural and safe Australian product that helps save your lawn from burn patches caused by dogs when they urinate on your grass. They filter out impurities in water, such as tin, ammonia, and nitrates. Dog Rocks have absolutely no harmful side effects to dogs, and even if your dog shares his bowl with the cat, it is fine for your cat to drink this water too. There is no change to the pH balance to either of your pet's urine. The impurities are generally passed out through urine, and when they come in contact with grass, it results in grass burn; a dead yellow patch of grass. Dog Rocks make the water source cleaner for your pet and eliminate grass burn. Water without impurities from Dog Rocks will actually help your pet to fertilize your lawn. Your grass will start looking greener and fresher in no time at all. Dog Rocks are a naturally mined product so the rock sizes differ from pack to pack, but the weight of each pack is always consistent. There are usually 1-3 rocks per pack. It is important to make sure that your pet drinks solely from this source of water, as any other water that they drink will not have been filtered by Dog Rocks, and will therefore reduce the benefit of Dog Rocks. Top off the existing water in the bowl everyday rather than replace the water. Change the water when the dog is least likely to consume large amounts of water. WHAT ARE DOG ROCKS - Dog Rocks are made from naturally occurring paramagnetic igneous rock mined in Australia, and provide a 100% natural solution to urine burn patches on lawn, shrubs and box hedge caused by your dog. Dog Rocks do not affect the pH balance of your dog's urine and is safe for all household pets. HOW THEY WORK - Dog Rocks work like a sponge, absorbing excess nitrates and other trace elements from your dog's water that cause urine to burn grass. By simply placing 200 grams of Dog Rocks into a half-gallon of water in your pet's water bowl, your lawns will start to look greener and fresher. SAFE FOR YOUR PETS - Dog Rocks have been laboratory tested and are safe for your pets. Your doggos and puppers be happy, just like you when you see those burn spots start disappearing as Dog Rocks takes effect. NO MORE BURN SPOTS - Within 3-5 weeks, you should start to notice a change in your lawn's appearance and new urine patches should not appear. If they do, verify that your pet's water bowl is their primary source of water and that it does not hold more than a half-gallon of water with 200 grams of Dog Rocks. ONE YEAR SUPPLY - Each 600 gram bag will last for 6 months. Simply place 200 gram units of Dog Rocks into your pet's water dish and replace every 2 months to prevent urine patches so your lawn remains lush and green. If you have any questions about this product by Dog Rocks, contact us by completing and submitting the form below. If you are looking for a specif part number, please include it with your message.